Hi de ho. Here it is, my salute to Summer. Well, not technically Summer yet….Ok Spring. I am finally putting my face forward to the heat, sweat and humidity that awaits. I will do my best to embrace the long hot days ahead without complaint, but I make no promises. I will even try to smile about it. To prove my point I will inspire you with pleasant thoughts of Summer fruits, dripping ice cream and happy children playing. There are a few new recipes I’m working on that reflect this highly anticipated season that most Aussies long for. I’m waiting patiently for the harvest of our backyard mango tree so I can make some delicious coconut cupcakes with mango ganache. Our mulberry tree is loaded with luscious fruit at the moment, so I am also experimenting with various berry compotes. And then there are our soon to be bulging passionfruit vines. A bumper crop of sweet summery harvest just around the corner. 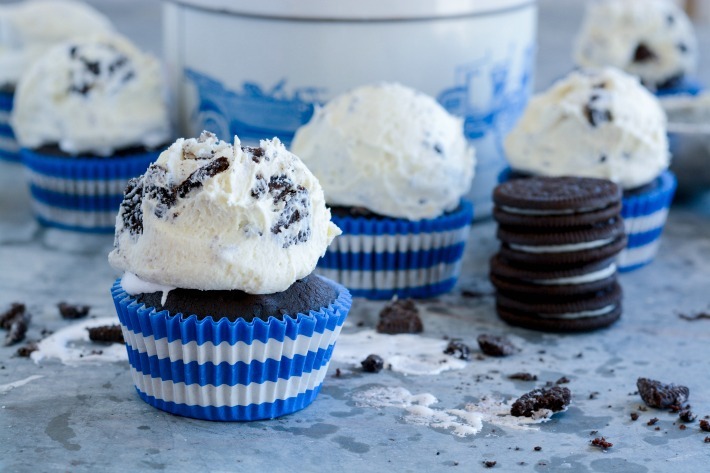 To kick start the warmer months I am offering you my delectable chocolate Oreo cookies & cream cupcakes. They are quite rich, and designed to look like your favourite chunky choc ice cream, oozing with the essence of Summer. These cupcakes are loads of fun and the kids will border on idol worship of you if you make a batch for their friends these holidays. 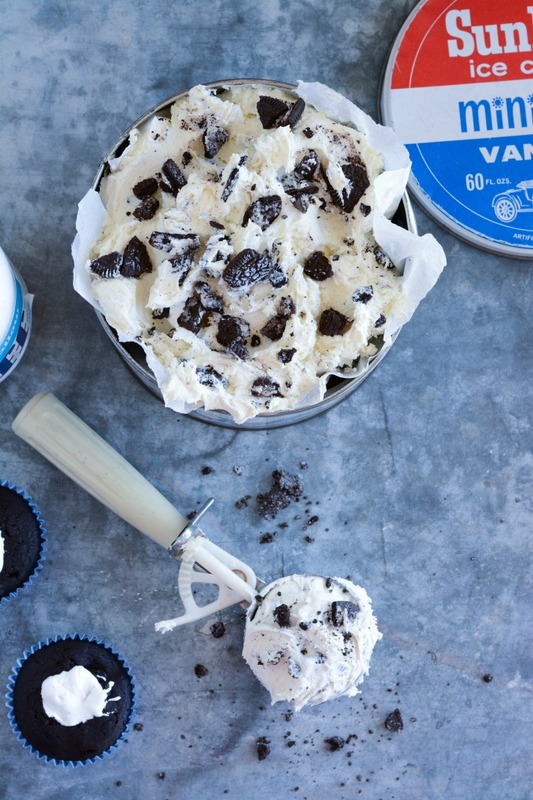 The coolest part is the ice cream scoop of chunky Oreo frosting on top. Totally delicious. 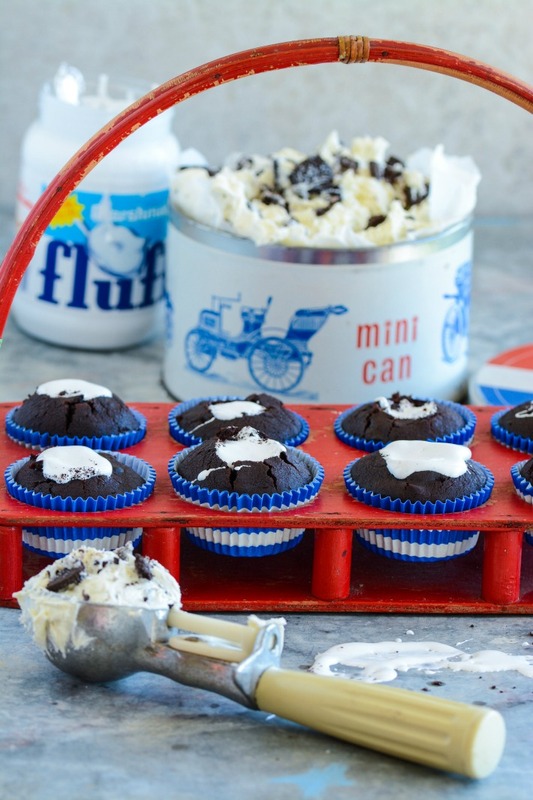 For maximum child appreciation, scoop out the middle of each cupcake and fill them with goooey Marshmallow Fluff, found in the American food section of the supermarket alongside Reece’s Peanut Butter cups and Hershey’s chocolates. Your children will love you forever. 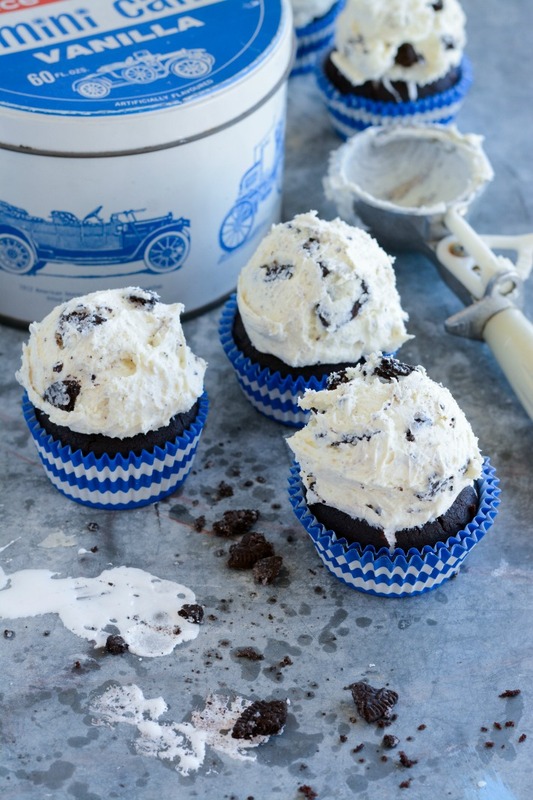 A fun chocolatey crunch cupcake with Oreo Cream Cheese buttercream scooped on top of a gooey fluffy marshmallow filling. 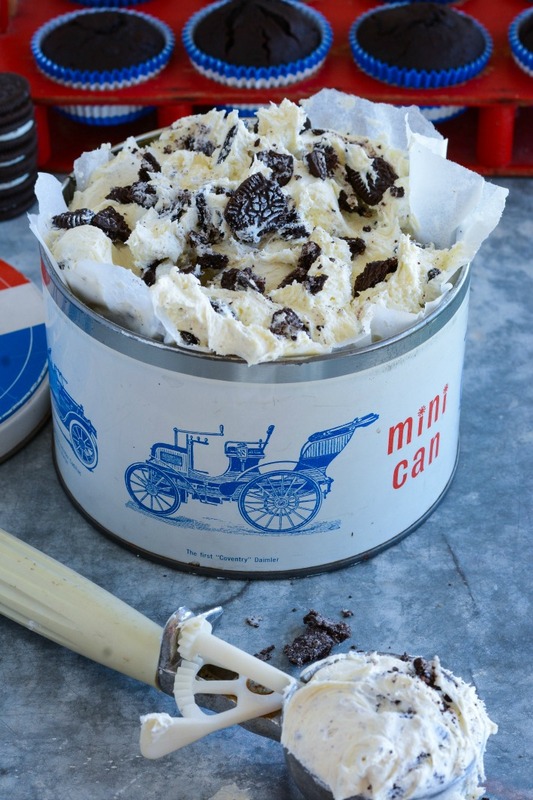 The kids will think they are in ice cream heaven with this one. 1 cup strong expresso coffee Or dissolve 1 heaped tablespoon instant coffee in 1 cup boiling water. Cool slightly . 3 -4 cups icing sugar, sifted Approx. You may need more or less. I also prefer to use Icing mixture. 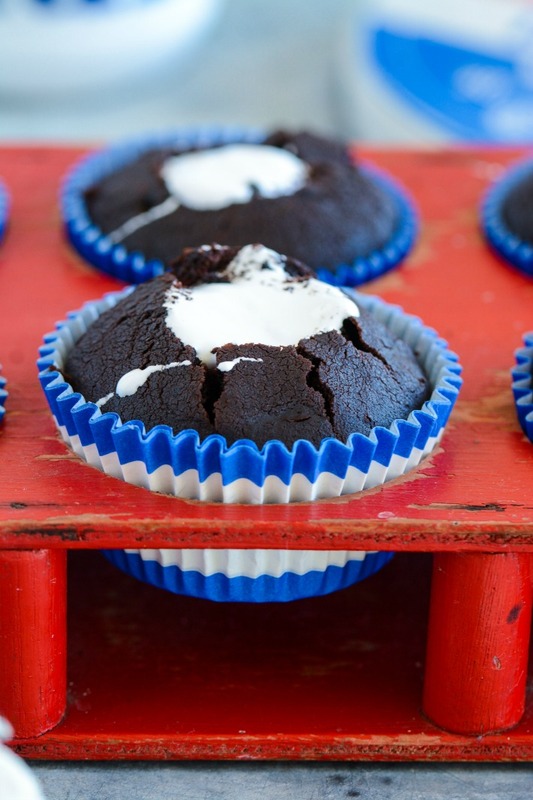 Line two muffin trays with 18 cupcake liners. In a medium mixing bowl, using a hand whisk, beat eggs and vanilla. Add oil and sour cream. Mix well. In a separate bowl, sift together flour, bicarb soda, baking powder and sugar. Whisk until combined. Gently pour wet mixture into dry mix. Whisk carefully until well combined. Add extra 1/2 cup of milk to ensure the mixture is smooth, but not runny. carefully fold in bashed Oreos. 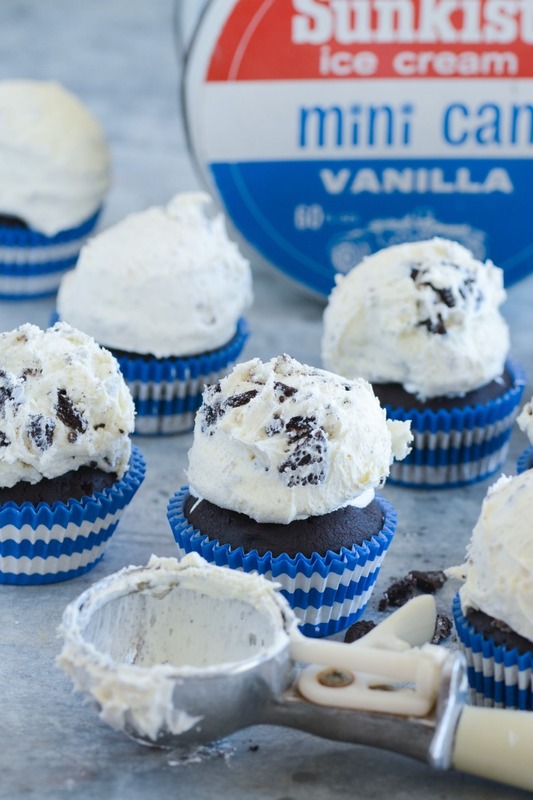 Using an ice cream scoop, place mixture into prepared cupcake liners until each is 2/3 full. Bake in a moderate oven 20 minutes or until firm to touch and a skewer comes out clean. Cool on wire rack. 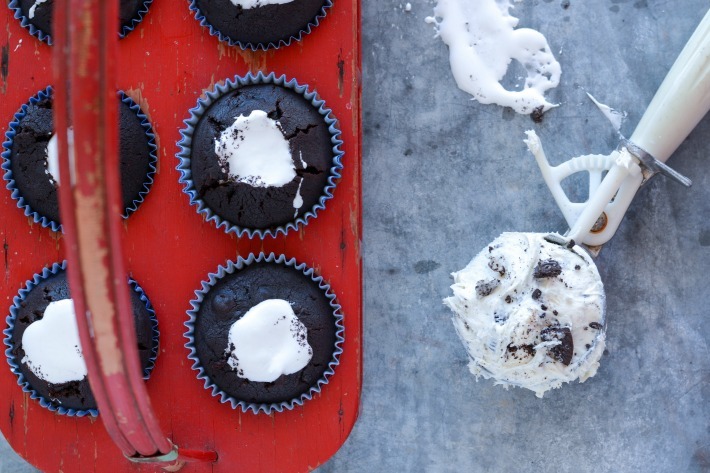 When completely cool, cup out tops of cupcakes using a steak knife or the wide part of a large icing tip. 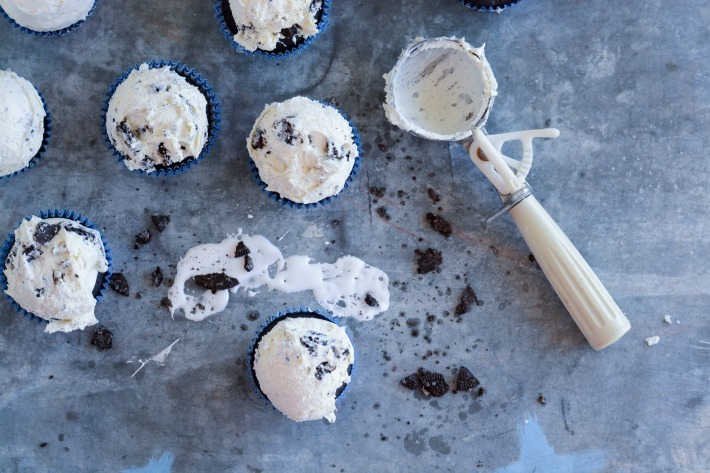 Scoop Oreo cream cheese frosting on top of each cupcake with an ice cream scoop. In the bowl of an electric mixer on med-high, beat butter until light and fluffy, about 3-4 minutes. Add chopped cream cheese and continue to beat another 3-4 minutes until very creamy. Turn mixer onto low and add vanilla. Slowly add icing sugar, a little at a time. Add cream as needed to give desired consistency. 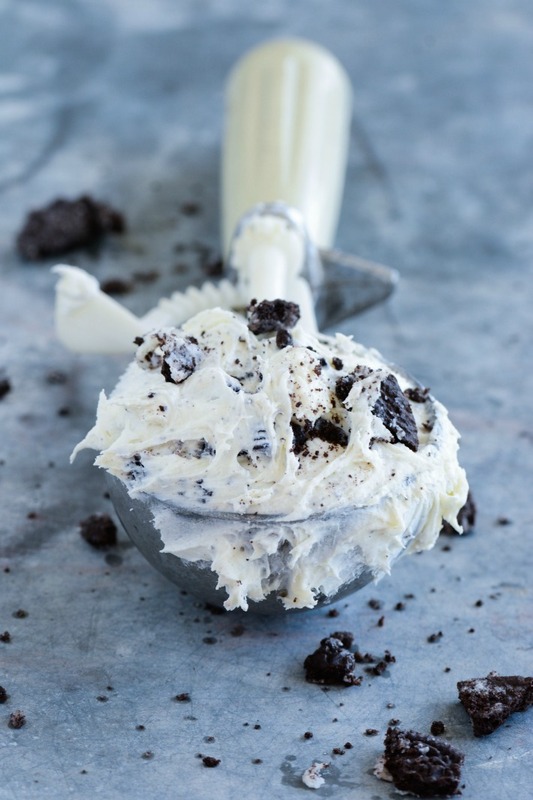 Remove bowl from mixer and using a wooden spatula, fold in roughly bashed Oreos. Do not over mix or the frosting will go a mucky grey colour. 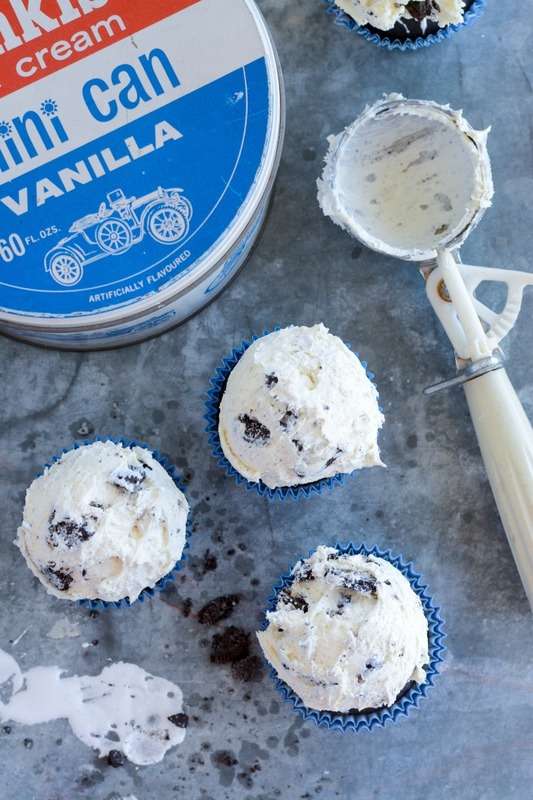 Using an ice cream scoop, place frosting onto cupcakes to look like ice cream. Serve to hungry hoards of children for maximum appreciation. Gosh, these look so good that even I might be tempted to put on my swimmers this year and run screaming hoorah into the clear cool water at the beach. NO, hold that thought. I think instead you will find me sitting under a tree looking through the pages of a delicious cake book sipping a thermos of tea planning my next cupcake recipe. Ahhh yes, that sounds better.